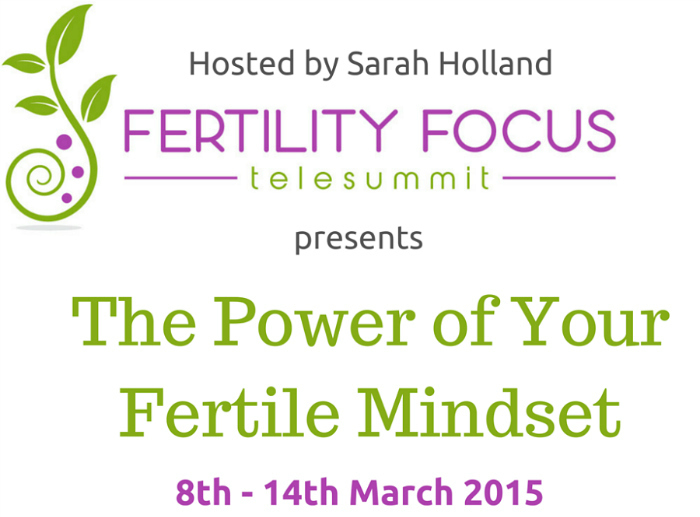 We are excited to announce that this years Fertility Focus Telesummit will host 3 events. The first one will be starting on March 8th and will run through March 14th. This first Fertility Focus Telesummit will focus on the power of your mind to transform your thoughts and beliefs surrounding your ability to conceive. Are you curious about how your emotions could be impacting on your fertility? Do your past and present experiences, your thoughts and beliefs have an impact on your ability to conceive? Can visualizations, meditation, hypnosis and EFT support fertility? These topics and many more are about to be explored by a panel of leading fertility experts, and I’d love to invite you to listen in. The Fertility Focus Telesummit is a “virtual event” that you can attend for free from the comfort of your own home. Once you register, you will have access to top quality fertility support from leading fertility experts. In this first event of 2015 you’ll discover how to transform the emotional aspects of your fertility, unlock your true potential and arm yourself with support and techniques for success. Location: Your home – listen in to the whole event online! Register: Click here to register your FREE place now! You can listen in to all the fertility-focused presentations online every day of the Telesummit for FREE, starting on Sunday 8th March.